The Columbia River 2814 Noma Compact is a scaled-down version of the original Noma. Like its bigger brother, it is a Scandinavian-style folding knife built for hunting. The broad, strong blade is ideal for dressing game, with a powerful drop point tip and a long, sharp plain edge for efficient slicing. 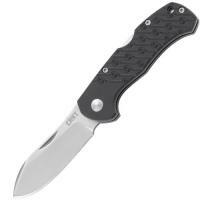 The lock back design secures the blade in place easily for total security during use. Its glass-reinforced fiber polyamide handle comes with bold surface texturing for a secure grip even with wet hands, and its ergonomic shape makes it very comfortable to use. It includes a pocket clip for portability, and a lanyard hole that can be used to lash the knife to your wrist for retention.